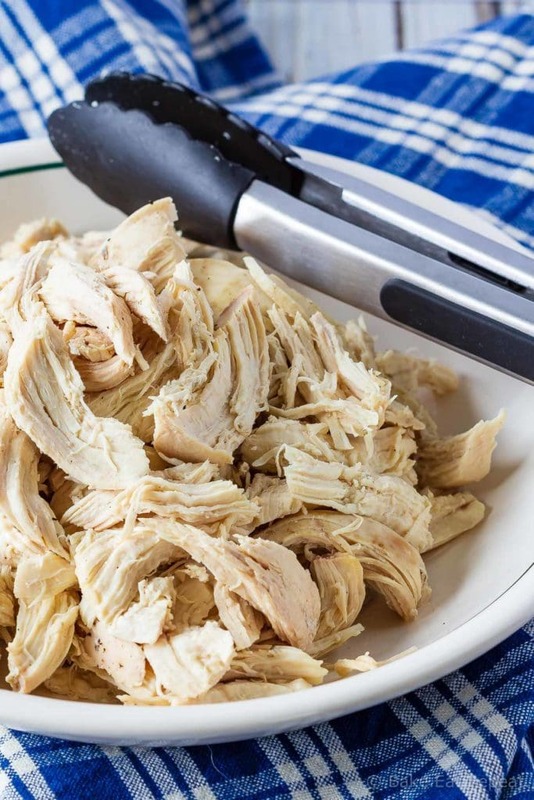 Easy to make, Instant Pot shredded chicken – you can pressure cook chicken breasts for cooked, shredded chicken in minutes – with fresh or frozen chicken! If you have an Instant Pot and haven’t yet started cooking chicken breasts in it for recipes that call for cooked, shredded chicken….you need to start. I love my Instant Pot for this. In the past, I’ve always made shredded chicken in the slow cooker when I’ve needed it. 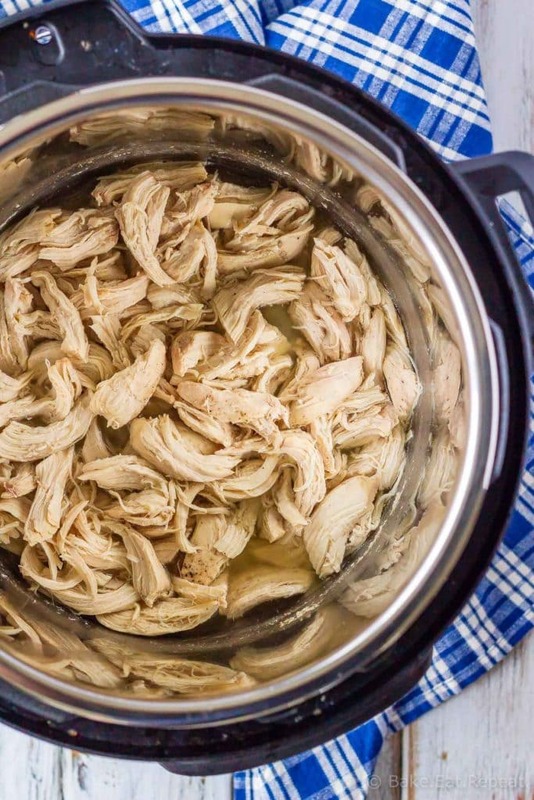 It’s super easy – slow cooker shredded chicken is definitely still a dump and go recipe that ends up with cooked shredded chicken, so it’s great. And I’ll probably still make it that way when I’ve planned ahead a bit, and I need it to be cooking while I’m out of the house for a few hours. But….I am not the greatest at planning ahead. I strive to do meal planning and follow a bit of a schedule because my life is definitely easier when I do those things. A lot less running to the store for the one thing I don’t have if I’ve planned ahead. Sadly, this hasn’t convinced me to up my meal planning game. One of these days I’ll get better at it though, and then I’ll have to share the secrets of how to actually meal plan. If you already possess those secrets and can help me be better in this department, please share! Anyhow, since I don’t often plan ahead, when I need cooked, shredded chicken for a recipe, I usually need it immediately, if not sooner. And the Instant Pot comes to the rescue. Fresh chicken breast only takes 8 minutes to cook in the Instant Pot. It will take an additional 10-15 minutes for the Instant Pot to come to pressure though. How long does it take to cook frozen chicken in the Instant Pot? Frozen chicken breasts need to be pressure cooked for 12 minutes in the Instant Pot. Plus the additional 10-15 minutes for the Instant Pot to come to pressure. Even if you forget to defrost your chicken you can have cooked, shredded chicken breasts in under a half hour. That’s amazing. I have an 8 quart Duo Instant Pot, so I use 2 cups of chicken broth for this recipe – if you have a smaller version you will only need 1 cup for the pressure cooker to come to pressure, but it won’t hurt to use 2 cups either. You can cook as much or as little chicken as you like in one batch, as long as you don’t fill your Instant Pot more then 2/3 full it will be fine. I usually cook 3-4 chicken breasts at one time, and if we don’t use it all for whatever recipe I’m making, I freeze the leftover shredded chicken to use later, or use it in sandwiches that week. Here are a few great recipes for you that use cooked, shredded chicken: Pesto Chicken Pull Apart Sliders, Chicken Pot Pie, and Buffalo Chicken Pizza. 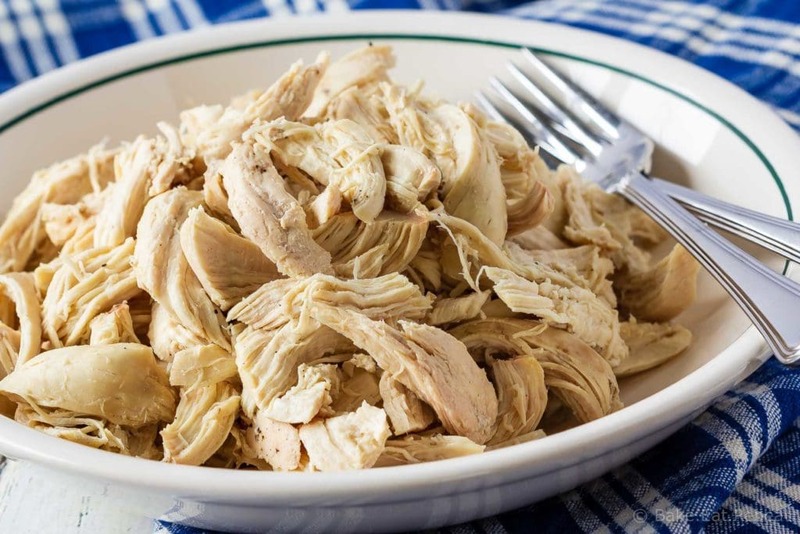 Easy to make, Instant Pot shredded chicken - you can pressure cook chicken breasts for cooked, shredded chicken in minutes - with fresh or frozen chicken! Pour the chicken broth or water into the Instant Pot and add the chicken breasts. Season the chicken with salt and pepper. Secure the lid, making sure the valve is closed. Cook on high pressure for 12 minutes for frozen chicken, 8 for fresh chicken. The Instant Pot will take 10-15 minutes to come to pressure before the cook time starts. When the cook time is finished, quick release the pressure, and then open the lid. Use two forks to shred the chicken. I find it easier to remove the chicken to a cutting board to shred it, but you can do it right in the Instant Pot if you prefer. It shreds more easily when done immediately, while it’s still hot. Use the shredded chicken immediately in any recipe calling for cooked chicken, or freeze it in an airtight container or ziplock bag for up to 3 months. This recipe can easily be increased to make more if you like. You don’t need to increase your chicken broth - just use the amount of liquid necessary for your Instant Pot to come to pressure. I have an 8 quart Duo which needs 2 cups of liquid, but smaller ones only need 1 cup so you can just add that, although for this recipe the liquid doesn’t need to be measured exactly - as long as you add enough for the pot to come to pressure.